Chris Brown buzzer bars and bank sticks need no introduction and have been used by many top anglers for a very long time, they go on and on! They are designed to meet the punishing standards required by today’s specialist angler. We have sold a huge amount of these items over the years and get many referrals from our existing customers. We do not use stainless steel as it is heavy, soft and expensive. All bank sticks and buzzer bars are made from strong aluminium sections. The finished set is anodised in matt black to BSEN12373/AA25 standard giving full architectural protection and will give you a lifetime service. All equipment uses our unique square bar/bank stick locking system. The 2 rod set up is ideal for tench and barbel, or just 2 rod carp fishing. The 2 rod version uses two 10” or 12” buzzer bars. The buzzer bars on this set up fix to the bank stick with a beautifully machined knurled screw. The bars cannot spin round on our unique fixing, which is a very useful advantage. 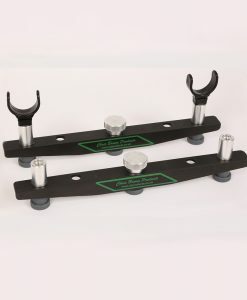 This system offers a wide range of settings and is supplied complete with all fittings and small, neat, rear rod rest heads. 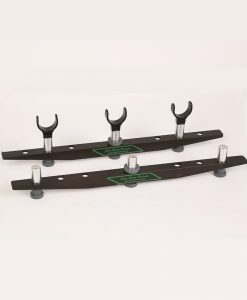 This set up can be supplied with a choice of either 8”, 12”, 16”, 24”, 36” or 48” bank sticks and 10” or 12” buzzer bars, which are fully machined to give various settings. The 3 rod set up includes all the items required and is again to the same high specification as the 2 rod set up. This has proven very popular for many years. The 3 rod version can be supplied with a choice of either 8”, 12”, 16”, 24”, 36” or 48” bank sticks and 15” or 18” buzzer bars, which are fully machined to give various settings. For many years the Chris Brown bank sticks and buzzer bars have produced a very sturdy goal post set up and are used extensively throughout the UK and particularly for monster carp expeditions in Europe. Bank stick and buzzer bars can be selected as required. This gives the well accepted locking arrangement which is unique to a Chris Brown set up. However, you may need four extra special screws depending upon the set up. All the above items are incredibly light and stronger than stainless steel. The points are rolled and virtually indestructible.